Comcast(s cmsca) took the lion’s share of new broadband subscriber additions in 2013 proving that the largest provider has a clear advantage over its smaller counterparts. 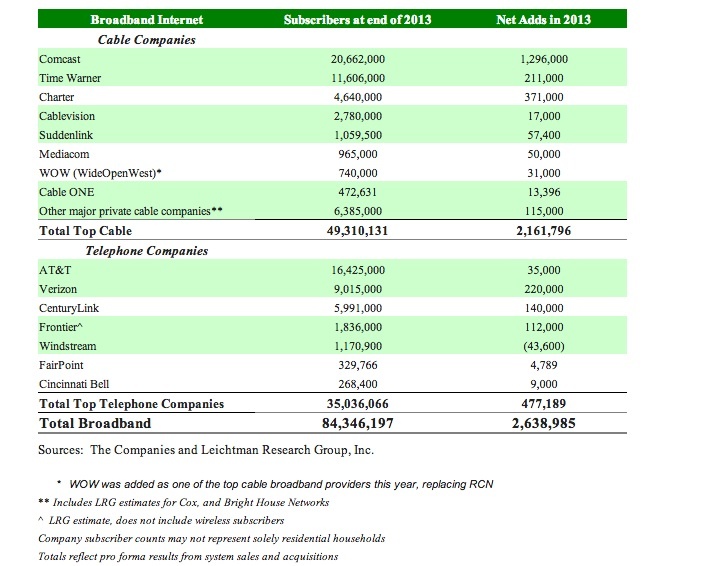 According to data out this morning from the Leichtman Research Group, the seventeen largest cable and telephone providers in the U.S. – representing about 93 percent of the market – acquired over 2.6 million net additional high-speed Internet subscribers in 2013. That’s slightly less than the net adds from 2012. Comcast added about 1.3 million broadband subscribers in 2013 – accounting for 49 percent of the total net additions for all providers in the year. On the telco side, Verizon(s vz) added the most new subscribers with 220,000 new subs, or a bit less than 10 percent of the total net adds. Most of the net adds — 82 percent — came from the cable companies, although it appears that thanks to new fiber-to-the-home and fiber-to-the-node deployments, telcos did get a greater percentage of the new additions in 2013 compared to 2012.